AURA 3 will present more than 35 talented acts on two juxtaposed main stages along with a new Brotherly Love Productions Campground Stage, offering over 15 hours of musical bliss each beautiful Florida Spring day. Bringing together some of the best touring bands in the livetronic scene and jam community including Papadosio, Brothers Past, The Heavy Pets, The Malah, Biodiesel and Zoogma, festivalgoers will be treated to a variety of musical styles from rock, funk and jazz to roots reggae, jam-tronica and deep house. 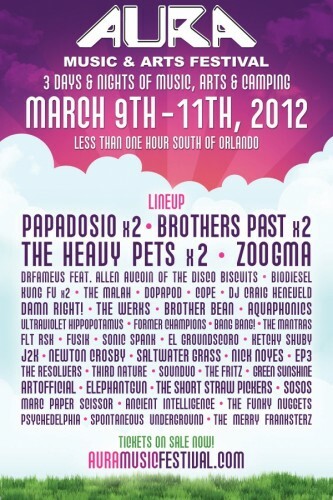 As a homegrown Florida event, AURA 3 will also feature the Sunshine State’s most innovative artists including COPE, The Resolvers, ArtOfficial, Fusik, Ketchy Shuby and Aquaphonics, rounding out the genre exploration at this cozy annual event that has quickly become a staple for music connoisseurs wanting to keep an ear to the Florida beat.